Montes de Malaga | La Rosilla - Lifestyle and food. Malaga a must see ! Although living on our mountain in rural Andalucia for the last 11 years, I do have to travel back and forth to the U.K regularly for extra work. Always on my plane journey the inevitable conversation starts by the fellow passenger next to me ‘ Going on holiday ?’ “no, I live here‘ I reply. I explain my story in brief, and ask of their onward journey plans. Most, probably 95% of them say they’re heading off to the Costa del Sol, or even say Malaga, when my eyes and ears light up, as this wonderful city holds a dear place in my heart and those that have visited, no doubt share the same enthusiasm for it , but they don’t actually mean Malaga the city, and have no plans to visit it, they either pass through, skirt pass or miss it altogether . Maybe secretly in my thoughts , part of me feels this is a good thing, perhaps they’re not the kind of folk who would be held under its spell, of passion, history, art, architecture, cosmopolitanism, diversity and gastronomy. The other side of me feels, don’t judge the place as an airport, be daring, take a detour, spend a few hours and explore, and get hypnotised by the power of this Andalucian treasure. Go, Malaga is a must see ! Even visiting regularly as we do, it always feels a special treat to take a day out in the city. Luckily Malaga is on our doorstep well just a 30 or so KM’s away, but in the mountains nothing is too close. We can hop on a bus from our local town of Colmenar, relax for the 40 minute journey, only costing a couple of euros and hop off the other end to explore, shop, eat,& tapear (eat lots of tapas in lots of places). This visit, we planned our itinerary around roof-top terraces, lazy lunch, cocktails and views to to die for. Malaga even in 38 degrees did not disappoint . 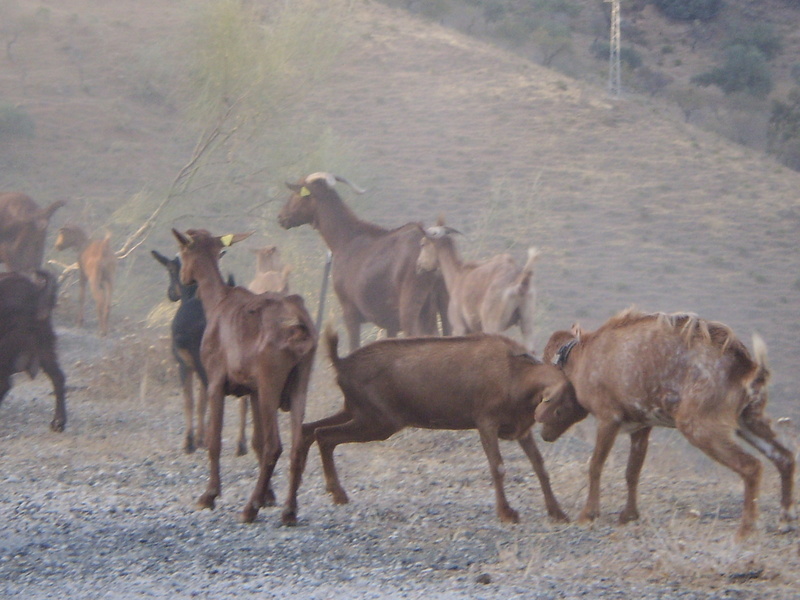 Living in the Montes de Malaga, a daily spectacle we are fortunate to see are the goats grazing on the mountainside, and being ushered along by their faithful shepherds, leaving a trail of goat devastation about them. One of the first things my baby daughter learned to say in Spanish was ‘Cabras’ , often as we drive the mountain roads, and turn blind corners we are met head on by a herd of goats casually wandering and going about their hunt for food. The benefits of the herds naturally wandering, means their food they consume, is full of wild goodness, thus resulting in milk rich and plentiful. My local town of Colmenar, makes the best from this milk, in way of fabulous Goats cheese, and on my doorstep, the milk is collected daily from farmers of the co-operative and from the length and breadth of the Axarquia , to the ‘fabrica de quesos‘ the cheese factory in the town. Yesterday I was fortunate to accompany the inspiring Axalingua language school on their tour of the factory and a behind the scenes view, of the cheese production. Hand made cheeses and a small factory keeping the local produce alive. 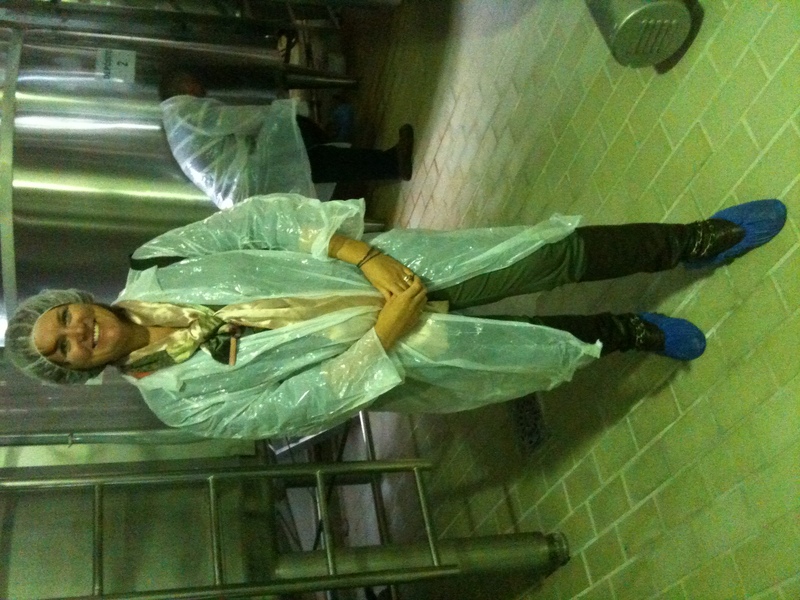 Donning my protective and hygienic robes, we were showed all forms of production, from the milk arrival to the storing & curing to the packaging. After our visit of the factory, we were invited to sample the delicious cheese. Queso Fresco, a soft, white young cheese, made one day eaten the next, ideal for aperitifs, and desserts, and used in salads. I love it cubed mixed with ripe tomatoes, olives sliced red onions, a sprinkle of salt & dried wild oregano and drizzled with balsamic syrup. Semicurado – This is a cheese that is left to cure for 1 to 3 months, increasing in flavour and hardening, and ideal cheese foe everyday use. Leche Cruda- A cheese of intense aromas and flavour, conserving all the natural properties of the goats milk. Curado – My favourite a strong, hard cheese left to cure for many months to harden, it almost has a light spicy flavour. Enjoyed on its own in all it’s glory alongside a crisp cold fino. I love to keep these cheeses in my fridge, along with some local membrillo (quince paste) , and if we have impromptu guests, we have the perfect tapa, and a real taste of our home in the ‘Montes de Malaga’.